When people ask me what my favorite restaurants are, this one always comes up. I have been here twice before, and they are two of the most memorable meals I have ever had. I’m not alone; the restaurant gets the top rating in almost every culinary publication (3-star Michelin, Forbes 5-star, AAA Five Diamond, 19/20 on Gayot). It even garnered a rare 4-star review from LA Times critic S. Irene Virbila. 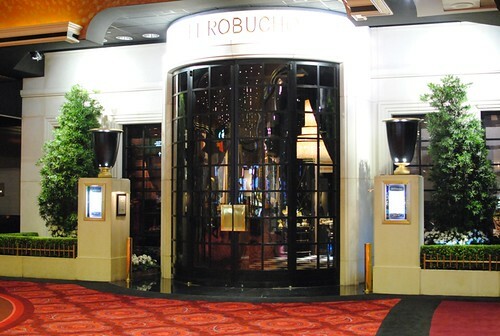 The restaurant is unabashedly extravagant, excessive really, starting with a complimentary limousine to the restaurant. 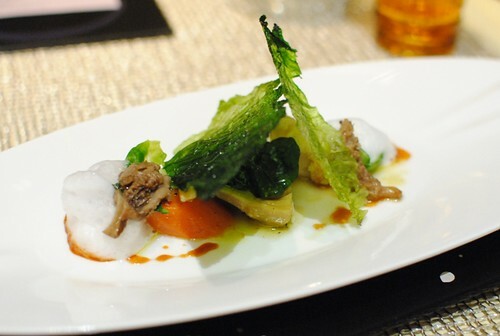 A number of a la carte options are available, as well as a 16-course tasting menu. The restaurant doesn’t necessitate the same menu for everyone, which I thought was really nice. As a result, my mom had a 4-course of her choosing, while my dad and I had the 16-course. The first thing that came around was this amazing bread cart. Seriously, I’ve seen bakeries with less selection than this. The picture isn’t even a full representation – there were more breads on lower shelves of the cart. I didn’t count, but I think there had to be around 20 varieties. Given that I had 16 courses coming, I had to control myself a little here. These were all excellent – I especially liked the bacon bread because of the extra bacon-y flavor. But I also enjoyed the subtlety of the milk and olive oil bread. There was a bright citrus flavor here from the lemon, balanced nicely by the fennel cream. Just a little bit of basil flavor was a nice touch too – a good start. 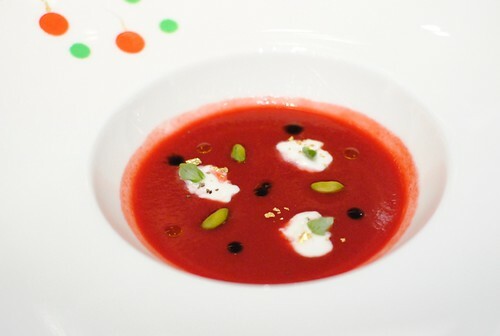 The gazpacho was slightly tart, but again balanced well with the creamy sheep’s milk ricotta. This was a rather unique meld of flavors, and I liked the crunchy pistachios as well. 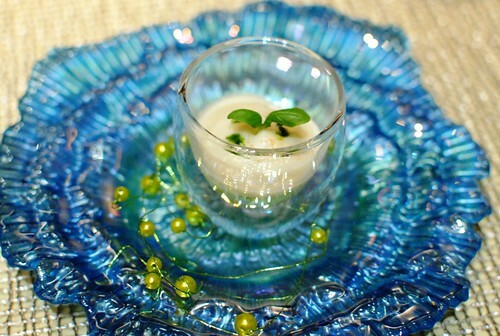 This next dish was a trio of Osetra caviar dishes. 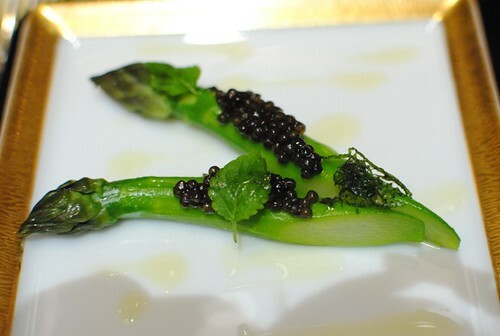 First was quite simply asparagus with caviar. Perhaps not the most dynamic pairing, but the vegetal quality of the asparagus was an interesting pairing with the salty caviar. 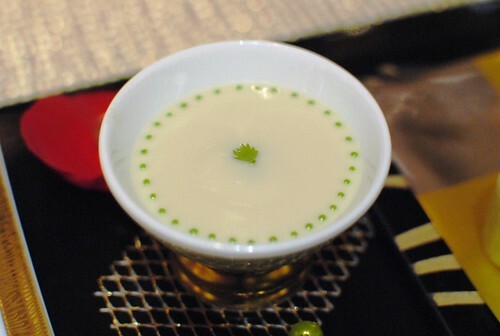 This was one of Robuchon’s signature dishes of a seafood gelee, cauliflower cream and caviar. Really good. 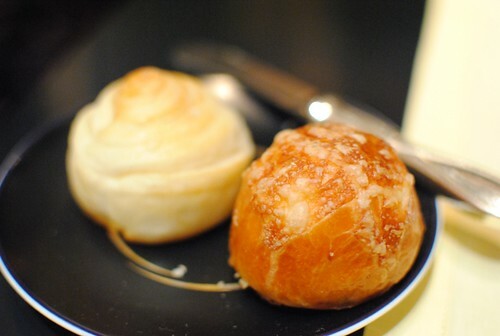 The custard was warm and so soft, with a subtle but present seafood flavor. The cauliflower cream was a nice touch too, especially with the salty caviar. 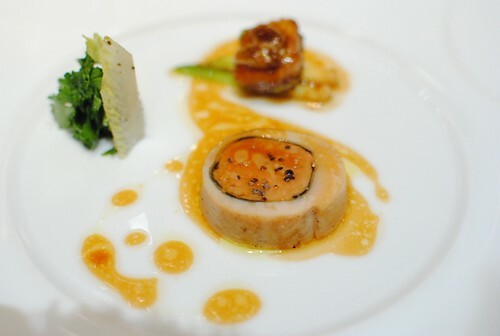 Lastly, a play on a sushi roll – looks like something Urasawa would serve. 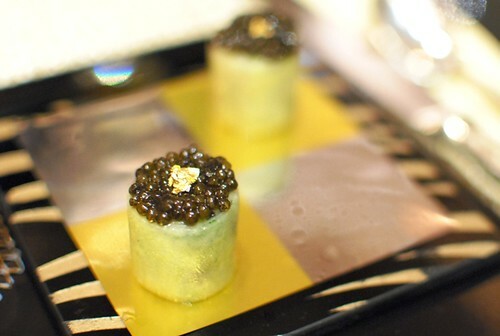 I really enjoyed the crunchy daikon and couscous in the roll, while the caviar really heightened the flavors. So pretty. 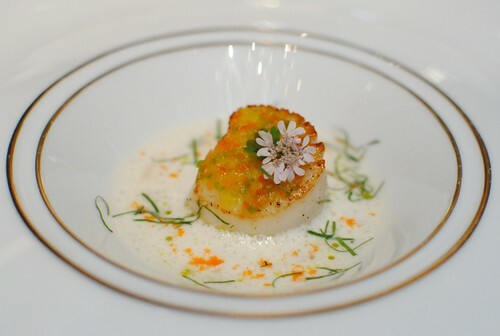 The scallop was cooked perfectly, and I enjoyed the broth with flavors from the coriander and creamy coconut milk. The ham made the difference for me in this soup. 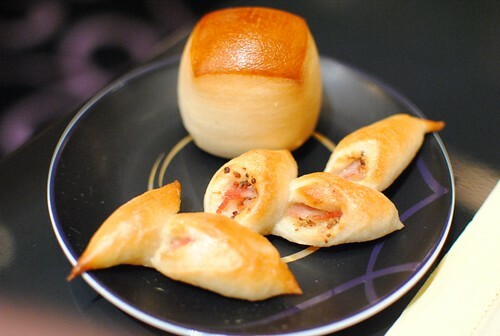 The pea-peppermint flavor was well-balanced, while the richness of the ham really added some extra depth of flavor. Very good. This was probably my favorite dish of the night. There were actually three parts – the lobster, baby octopus and the langoustine. First, the lobster was cooked well, with a tasty sake broth with a strong sea essence. Secondly, this baby octopus on top of saffron rice was very much like paella, though a very well-executed one. 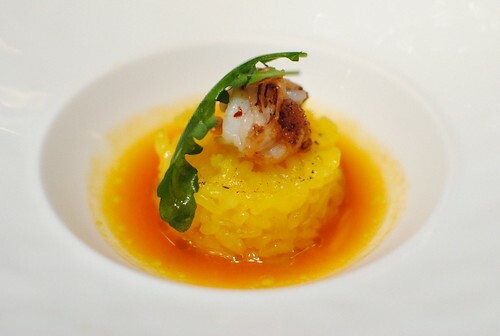 The rice was a nice al dente with a vibrant saffron flavor; the octopus was cooked perfectly too, leaving it quite tender. 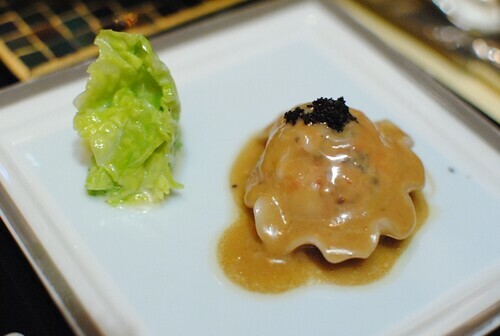 Lastly, one of Robuchon’s signatures – langoustine ravioli, here topped with black truffle. Perhaps the best bites of the night, the ravioli was stuffed with chunks of langoustine, which was really tender, sweet and full of flavor. The black truffle added another dimension, with a more subtle earthiness; a haute surf-and-turf if you will. Excellent. Compared to the previous courses, this wasn’t quite as exciting. 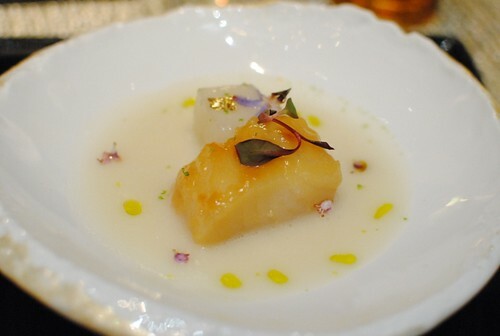 The black cod was prepared beautifully, served with tender daikon and some nice citrus from the yuzu. Well-executed, but I felt I’d had these flavors on the same plate before. The cabbage was really nicely crisped and kind of sweet. The carrots, artichokes and morels were all very good, though I’m not sure the composed dish was greater than the sum of its parts. 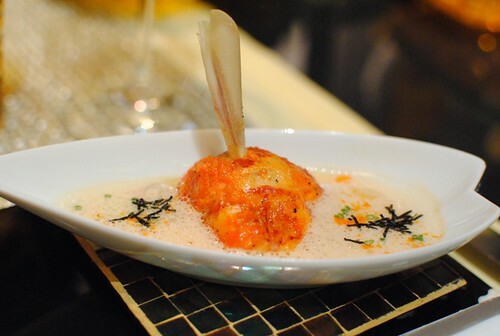 There were two parts here – foie gras stuffed chicken and a grilled yakitori-style chicken. I thought the stuffed chicken was a bit dense and not the most flavorful, but the foie gras was very good; meltingly rich and flavorful. The chicken prepared yakitori-style was delicious – tender, moist and just a little smoky. 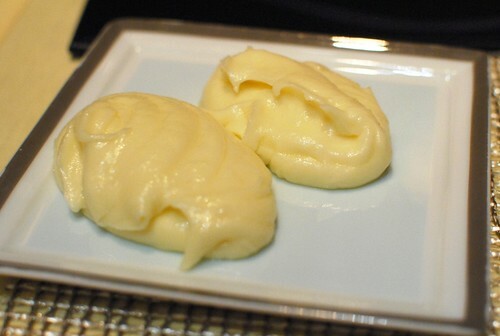 We requested a side of Robuchon’s famous mashed potatoes (pommes puree) as well – really rich and creamy, these were excellent. Lots of fat, for sure. 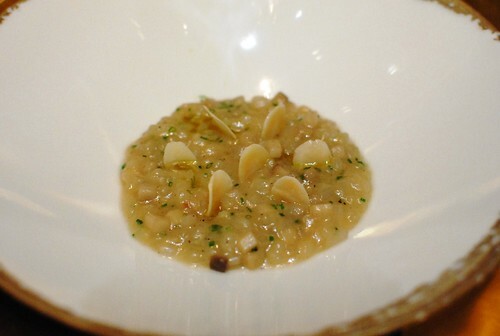 This was an interesting dish – soybean sprouts were prepared in a sort of faux risotto. Instead of rice, the sprouts gave a little bit of a more ‘fresh’ flavor and were still kind of starchy. I’m not sure how they got the richness of a risotto as well, but this was a very successful “low-carb” variation of the dish. This was the first dessert course. The panna cotta was delicious; light and smooth with a good almond flavor. I found the hazelnuts to be a little overpowering though because the almond flavor was so subtle. Before the next course, a cart of fresh herbs came by. 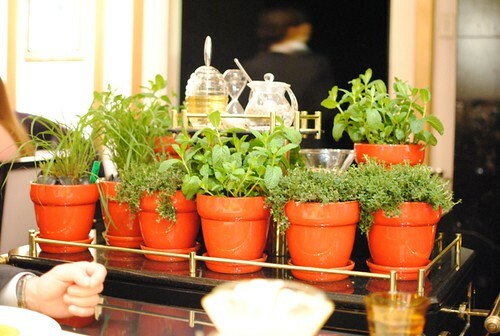 Spearmint, lemongrass and thyme were available for a customized herbal tea. I’d never seen anything like this before, and was super excited to try my thyme-spearmint concoction! The flavors here were reminiscent of strawberry shortcake, only with raspberries. 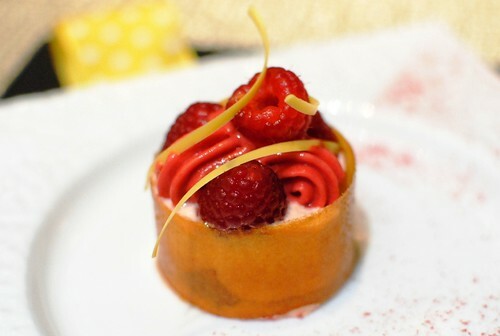 It wasn’t too sweet, which was good, and I thought the subtle ginger flavor in the sorbet nicely balanced the raspberries. 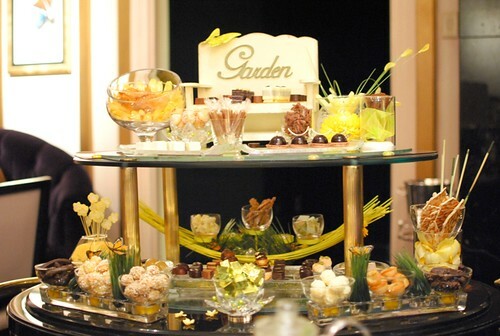 Lastly, the mignardises cart came by. The selection was (predictably) rather extensive. I only tried a few here as stomach room was limited. 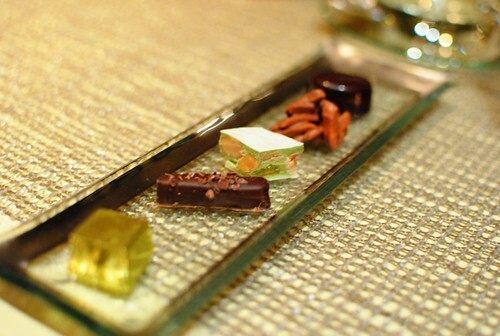 Pistachio nougat and chocolate opera cake are centered in each picture; each sweet I tried was pretty good and a nice ending to the meal. I just wonder where they all go once service ends for the night. 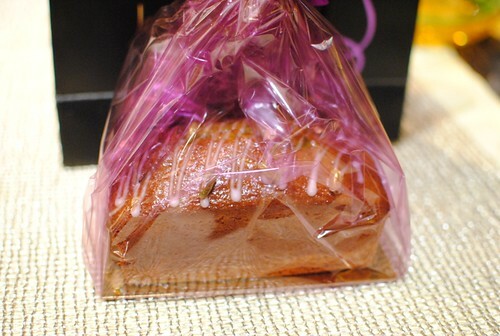 Lastly, a bag with the menu, a brochure of the restaurant and a pistachio-pomegranate bread was given to the females…in this case, we got one. This was an excellent meal. Thinking back though, there weren’t any dishes that were truly amazing, except for maybe the langoustine ravioli and the trio of caviar. For the cost (the tasting menu was $385), I might have expected just a little more. I had very high expectations and it didn’t disappoint, but it didn’t ‘wow’ either. 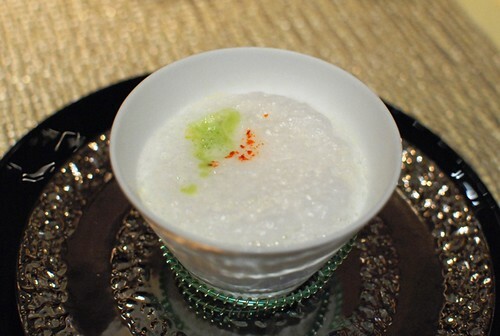 Still, it was definitely a memorable meal – the sheer opulence almost guarantees that. However, I don’t find myself in such a hurry to go back as I do with Urasawa or The French Laundry. I just shed a tear. WOW. I hope that’s not a sad tear? Dude, that’s a lot of bank for a bunch of good but not great dishes. Interesting, why do you think this meal wasn’t as impressive. Do you think your standards have gotten higher? Hard to say Ryan. Maybe? I think part of it was that, having been a couple of times, there were less surprises. Or my memory of meals were romanticized in my mind. why wasn’t the pomme purée served in the little staub coquette? No idea. I think last time it was, and they scooped out some quenelles at the table. Great post dude. 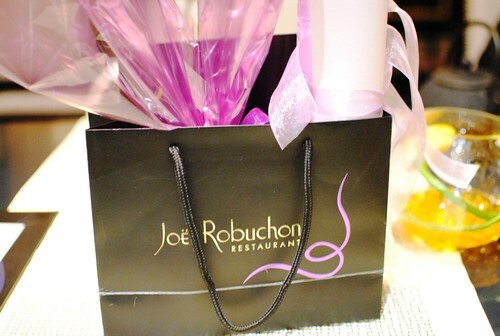 But I guess it’s Joel Robuchon, I expected more creative stuff from them. Nevertheless, it seems like you still had a good time. Thanks! It was a great time, but the reputation comes along with really high expectations, and it probably gets harder and harder to meet them. I would’ve been disappointed when the black cod showed up (I have never had bad black cod with some variation of Asian flavoring), but some of the stuff looks interesting. Wow, though, for $385 you should have your mind blown with every bite. Seriously – Asian-flavored black cod has become one of those standard dishes that most restaurants can execute fairly well now. Definitely was a little surprising to see that on the menu. i’m so jealous! i wish my parents would pay for my meal at JR.
Haha yeah, I don’t know what to respond to that. Yeah I just didn’t have quite the same impression this time. With TFL, I feel like whenever you can somehow get a reservation, you have to consider it. It had the looks of an epic meal, but it’s a shame that it wasn’t, especially at that price tag! I think I really need to find my way to TFL. 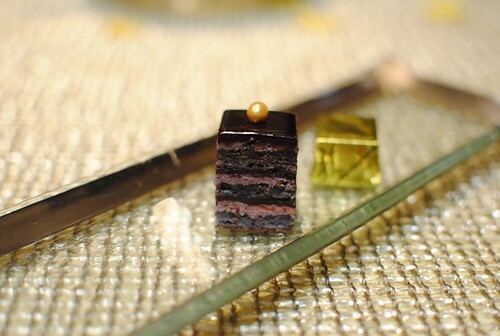 I loved the meal at Per Se, but I’m in no hurry to go back. 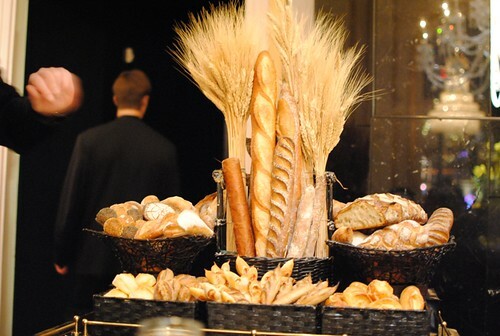 BTW, that bread cart looked pretty amazing! How was that herb tea? The bread cart IS amazing! I thought the herb tea was a nice touch, it tasted pretty much as expected. It’s really just fresh herbs and hot water. 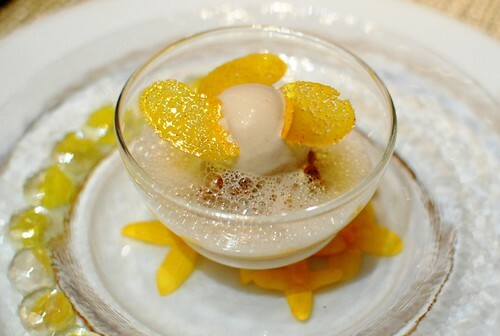 And yeah, you do need to find your way to French Laundry. I’ve never been to Per Se, but I think the Yountville “feel” to the meal does make it very different. My wife and I have reservations in June. We are looking forward to it since it’s our first time there. Would you recommend doing the 16 coarse or ala carte? I think that decision will depend on personal preference (if you prefer certain menu items over others) and quite frankly, how much you’re looking to spend. At a restaurant of this caliber, I tend to always recommend going with the tasting on the first visit. The four-course a la carte is still close to $200, so you would definitely get more “tastes for your buck” on the 16-course.